CEYA 3000 - Imported from Spain. We are now able to offer you this fantastic multi-purpose concept. This treatment sculpts and tones your body and face to perfection, besides regenerating degenerative conditions of the body. CEYA introduces a "spring-board" RADIOFREQUENCY treatment concept that will give you the client a new and sensational image in just 20 minutes. CEYA allows our therapist the opportunity to fill the gap between conventional aesthetic beauty and plastic surgery. The therapist mobilizes the muscle in depth and sculpts facial features in order to put the muscles back into their original location. The CEYA 3000 allows for passive treatment by the therapist, allowing her hands free to treat you the client. Facial and body device with three outputs, radiofrequency Youth Activator, controlled by microprocessors for treatments in a specific part of the body. Digital control panel. Body or facial treatments. Optional application: manual or automatic. Facial rejuvenation and body reshaping. 3 areas can be treated simultaneously. The treatments also include the revitalization, rehydration, and the regeneration of the skin, in which the cutaneous surface acquires a freshness and luminosity. 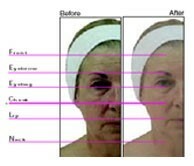 Facial rejuvenation and firming, effective and risk free. (Visible mini facelift). Bust lifting from 1.5 to 3cm per session (smaller busts). Gluteus/buttocks firming, orange peel and cellulite reduction. Abdominal and abductor firming and remodelling. Toxin and lymphatic drainage and elimination. (Oedema). Excellent for detoxification. It encourages the production of collagen, smoothing the wrinkles on the superficial layer of the skin. Improves bone density / calcium absorption. Stimulates metabolism – breaks down fat cells, body carries on losing weight & toxins thereafter. If red marks do appear then this indicates extreme toxin build-up in the area that has been treated. For optimum results we recommend that your first treatment should be a lymphatic detox session. NB: All treatments have an immediate effect on the skin leaving it smooth and rejuvenated after the first 20 minute session, lasting an initial three weeks. Consecutive treatments ensure a longer-lasting effect. One monthly maintenance treatment thereafter is all that is required. CEYA 3000 introduces a 3-simultaneous treatment concept, where the patient can be treated in a short space of time. Full treatment in 20 minutes! The results obtained for numerous medical conditions are of an exceptional quality and make it possible to treat various pathologies in a much more effective way, e.g. sports injuries, orthopaedic rehabilitation, pain management, traumatology, physical therapy, oedema, constipation, and aesthetic medicine.